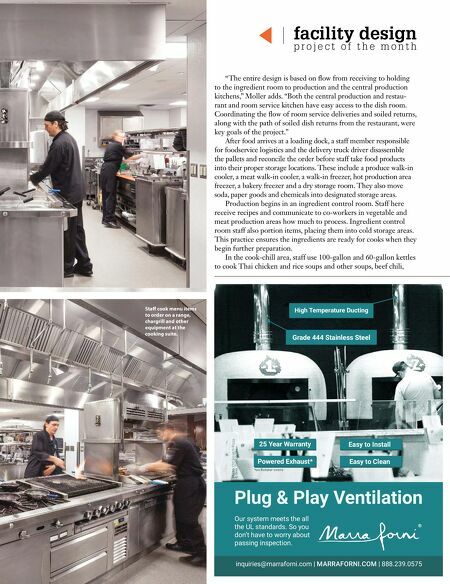 66 • FOODSERVICE EQUIPMENT & SUPPLIES • NOVEMBER 2018 facility design p r o j e c t o f t h e m o n t h of it was always in construction. We had to get very creative." At one point, for instance, the foodservice team set up portable steam tables in the old dining room space, dubbing the pop-up restaurant "Crunch Time." Customers placed menu items in disposable containers and ate in the dining room or took the containers back to their department breakrooms. 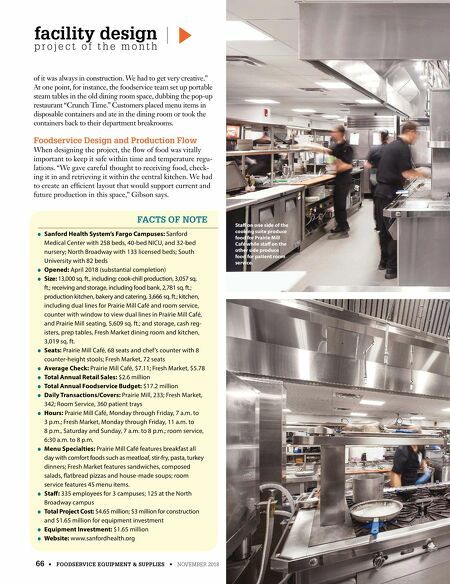 Foodservice Design and Production Flow When designing the project, the •ow of food was vitally important to keep it safe within time and temperature regu- lations. "We gave careful thought to receiving food, check- ing it in and retrieving it within the central kitchen. We had to create an ef•cient layout that would support current and future production in this space," Gibson says. O Sanford Health System's Fargo Campuses: Sanford Medical Center with 258 beds, 40-bed NICU, and 32-bed nursery; North Broadway with 133 licensed beds; South University with 82 beds O Opened: April 2018 (substantial completion) O Size: 13,000 sq. ft., including: cook-chill production, 3,057 sq. ft.; receiving and storage, including food bank, 2,781 sq. ft.; production kitchen, bakery and catering, 3,666 sq. ft.; kitchen, including dual lines for Prairie Mill Café and room service, counter with window to view dual lines in Prairie Mill Café, and Prairie Mill seating, 5,609 sq. ft.; and storage, cash reg- isters, prep tables, Fresh Market dining room and kitchen, 3,019 sq. ft. O Seats: Prairie Mill Café, 68 seats and chef 's counter with 8 counter-height stools; Fresh Market, 72 seats O Average Check: Prairie Mill Café, $7.11; Fresh Market, $5.78 O Total Annual Retail Sales: $2.6 million O Total Annual Foodservice Budget: $17.2 million O Daily Transactions/Covers: Prairie Mill, 233; Fresh Market, 342; Room Service, 360 patient trays O Hours: Prairie Mill Café, Monday through Friday, 7 a.m. to 3 p.m.; Fresh Market, Monday through Friday, 11 a.m. to 8 p.m., Saturday and Sunday, 7 a.m. to 8 p.m.; room service, 6:30 a.m. to 8 p.m. O Menu Specialties: Prairie Mill Café features breakfast all day with comfort foods such as meatloaf, stir-fry, pasta, turkey dinners; Fresh Market features sandwiches, composed salads, "atbread pizzas and house-made soups; room service features 45 menu items. O Sta•: 335 employees for 3 campuses; 125 at the North Broadway campus O Total Project Cost: $4.65 million; $3 million for construction and $1.65 million for equipment investment O Equipment Investment: $1.65 million O Website: www.sanfordhealth.org FACTS OF NOTE Sta• on one side of the cooking suite produce food for Prairie Mill Café while sta• on the other side produce food for patient room service.